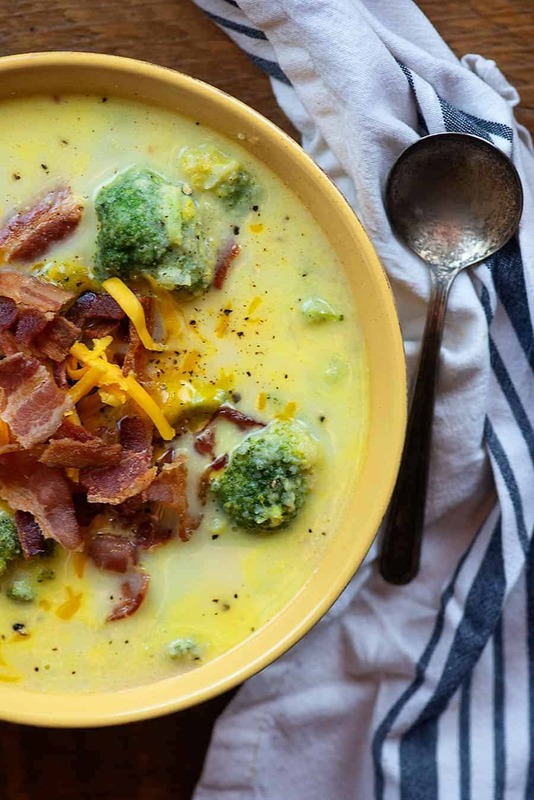 Broccoli cauliflower soup is creamy, comforting, and perfect for chilly nights! This healthy soup recipe is a hit with my entire family! I’ve been seriously riding the struggle bus this past month or so. It is so dang cold out there, I can not even handle it. BRB, moving to Florida immediately. Okay, not really – I’m stuck here in Illinois where the snow is a foot deep and the icicles dangling from my front porch could kill a person. The only hope I have is soup. Lots and lots of hot soup. I’ve made roasted cauliflower soup and I’ve made crockpot broccoli cheese soup. I figured I’d go ahead and marry the two and make a broccoli cauliflower soup. This soup is rich, creamy, and oh so tasty. I can’t get enough! 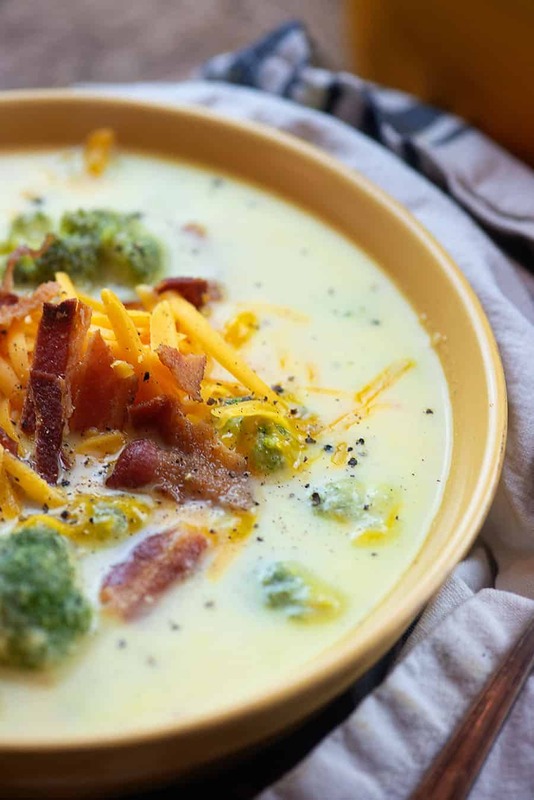 This low carb soup recipe is so creamy and tasty – you’re going to love the flavor, but you’re also going to love how easy it is! First, we’ll cook some onion and garlic in a little butter until soft and fragrant. Then you’ll add in some chicken broth and cauliflower. Season that up with some mustard powder, red pepper flakes, and salt. This doesn’t make the soup spicy, but does give it a little boost of flavor. 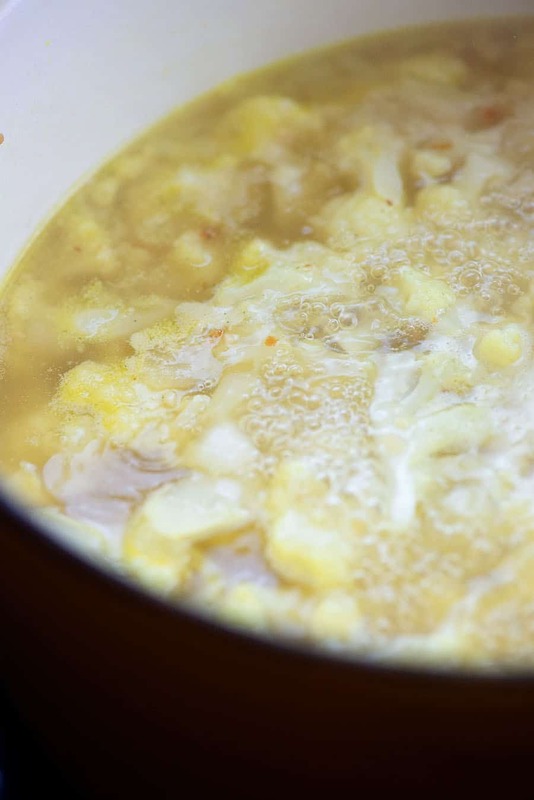 Bring your soup to a boil and reduce to a simmer. Let that cook until the cauliflower is nice and soft. I like this soup to be nice and creamy, so I used an immersion blender to blend the soup. Here’s the blender I use. 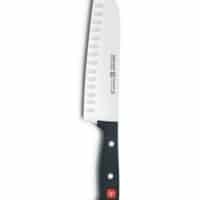 (affiliate link) I think it’s pretty fabulous, easy to store, and I use it at least weekly, which is way more often than I expected. It really comes in handy! 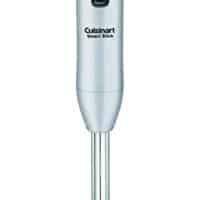 If you don’t have an immersion blender, you can carefully transfer the soup to your regular blender or you can use a potato masher. The potato masher will leave the soup chunkier than it would if you blended it, but the flavor will be the same. Once your soup is the texture you’d like, go ahead and add in some heavy cream and shredded cheddar. Stir that altogether until smooth and creamy and then stir in your broccoli. Let the soup simmer for another 5-10 minutes or until the broccoli is as soft as you’d like. 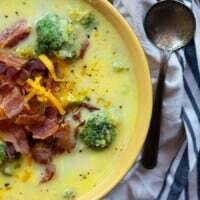 I like to serve this broccoli and cauliflower soup with some crumbled bacon and grated cheddar on top. A little sour cream would be nice too! Creamy and comforting! 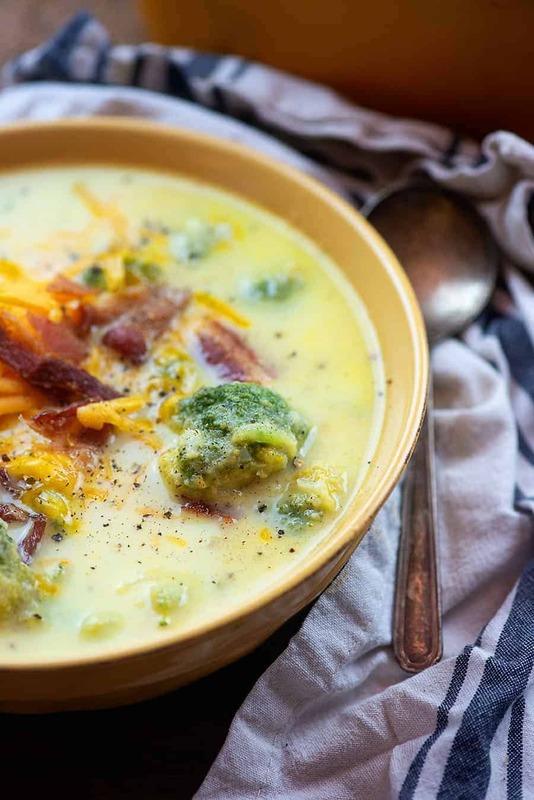 This soup is loaded with veggies. 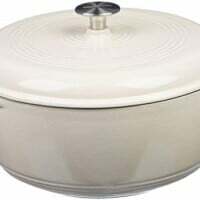 Add the butter to large, deep heavy bottomed pot over low heat and let melt. Add the onion and garlic to the pot and cook, stirring often, for 5 minutes to soften. Add the cauliflower, salt, mustard powder, red pepper flakes, and chicken broth to the pot and increase heat to medium. Use an immersion blender to blend the soup until smooth and creamy. Alternately, carefully transfer the hot soup to a blender and blend. Add the cream and cheddar to the soup and stir well to combine. 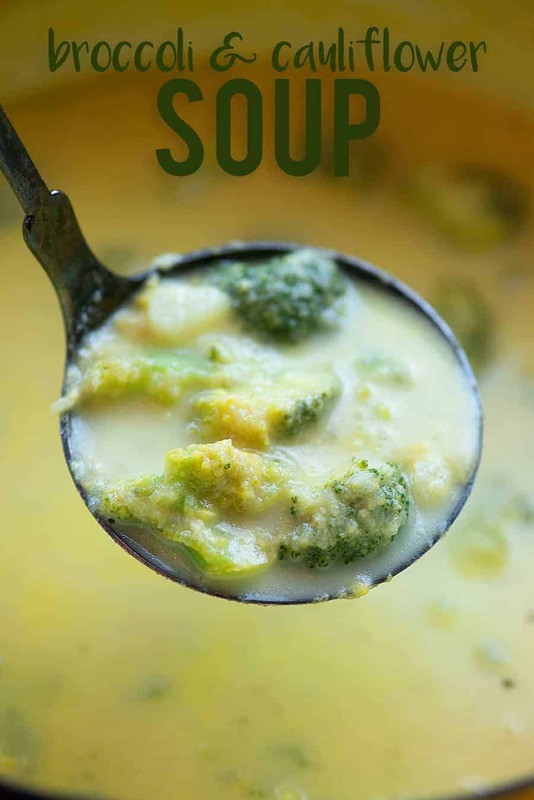 When the cheese has fully melted, add the broccoli to the soup and cook for 5-10 minutes or until broccoli is as soft as you'd like, stirring occasionally. Serve with additional grated cheddar and crumbled bacon, if desired. If you do not have a blender, use a potato masher to mash the cauliflower. The soup will have a chunkier texture, but the taste will be the same.